Today I get to tell you about a wonderful review item that Dial sent me! First off everyone loves body wash items and I am no exception. I have at any given time at least 3 body wash items in my shower. I have passed that on to my daughter. 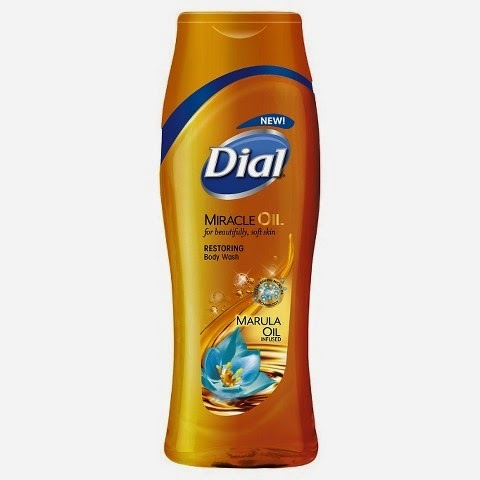 Dial has a new product that I was excited to try on my skin, Miracle Oil Body Wash. Sounds interesting doesn't it? Well, this new body wash has marula oil infused within to give your skin a soft and smooth feel. Marula oil is known to deeply hydrate and nourish skin while protecting it from skin damaging free radicals. Oils in hair and cosmetics are getting trendy so Dial had to bring that to their body line as well. I have to brag on the lather of the product. I love bubbles and I love that this body wash gives me lots of that to enjoy. The body wash has a pleasant smell. Most of all my favorite part is that after my shower I feel totally refreshed and my skin feels so soft and smooth. I love feeling wonderful after my shower! I normally take a shower to yes clean but to also relax and I am happy to say this helps! Enter to win a free coupon to try this awesome new Dial product for yourself! US residents and must be over 18.